Common coccygodynia is poorly understood. 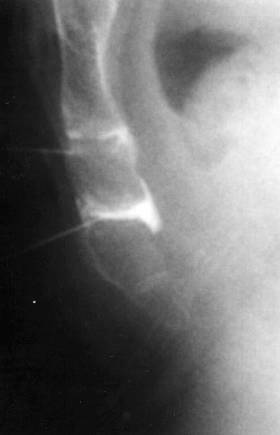 Numerous hypotheses have been proposed as to the origin of the syndrome, including pain from the pericoccygeal soft tissues, spasm of the muscles of the pelvic floor, referred pain from lumbar pathology, arachnoiditis of the lower sacral nerve roots, local posttraumatic lesions, somatization, etc (Howorth 1959, Jurmand 1976, Nelson 1991, Postacchini and Massobrio 1983, Stern 1967). Thus far, there has been no sound confirmation of any of these. Because patients often mention a fall on the buttocks or a delivery as precipitating event, a mechanical basis for the pain is likely. In addition, in the majority of cases, the pain occurs only in the sitting position. These factors led us to develop a protocol to document the painful coccyx with dynamic films and coccygeal discography (Maigne et al 1992, 1994). Dynamic films are defined as X-rays films in the lateral sitting position (the painful position) as compared with standard lateral roentgenograms. Since 1992, more than 700 patients with coccygeal pain have undergone this protocol. We summarize here the results of our studies on this topic. There is a paucity of information regarding this topic. According to Gray (1973), the sacrococcygeal joints are thin intervertebral discs of fibrocartilage. Occasionally, the intercoccygeal joints are synovial. By examining nine aged coccyges from fresh cadavers, we found that the sacrococcygeal joint was a disc in one case, a synovial joint in four cases and a third type in four cases, the joint being an intermediate structure made of a disc containing a more or less extensive cleft, parallel to the end plates, and bordered by annular fibres or synovial cells (Maigne et al 1992). This intermediate state was not found in the intercoccygeal joints. It is not known if young individuals show the same distribution or not, i.e. if a sacrococcygeal joint can be transformed from one form to another during a person's lifetime. A fourth type exists, in the form of ossification. Ossification can involve only the sacrococcygeal joint. Studying two different populations, the frequency of this type was found in 22 and 68% of the cases by Saluja (1988). In some of our patients, the whole coccyx was ossified. The physiologic movements of the coccyx are restricted to flexion and extension. Active flexion (movement in a forward direction) is performed by the levator ani and the sphincter ani externus muscles. Extension (movement in a backward direction) is due to relaxation of these muscles and to the increased intra-abdominal pressure which occurs during defecation and parturition (Smout 1969). It is a passive movement. Surprisingly, the movements of the coccyx in the sitting posture have never been reported in the literature to our knowledge. Flexion or extension can be encountered. Passive flexion is due to the direct pressure of the seat over the coccyx. In other cases, a passive extension is encountered, which is due to an increased intra-pelvic and abdominal pressure by the seat. The direction is depending on the coccygeal anatomy. The intervening factors are : 1) The angle between the sacrum and the coccyx (an acute angle makes the coccyx prone to flex, a flat angle makes it more prone to extend). 2) The sagittal pelvic rotation when sitting (a high degree of pelvic rotation when sitting brings the coccyx parallel to the seat, leading to flexion, a low rotation let it more or less vertical, prone to extension). 3) The body mass index, which is closely related to the pelvic rotation and 4) The angle of coccygeal incidence, which is also related to the pelvic rotation (see below). In other cases, the coccyx is not mobile when sitting (more frequently in males). This may sometimes (but not always) be attributed to a joint ossification. The standard way to X-ray the coccyx is to take the film in the standing position. I coined the word "dynamic exploration" for the comparison between a standard film and a "dynamic film", in a sitting (painful) position. The first (standard) film is taken in the lateral standing position. In order for the coccyx to be in a neutral position, it is very important for the patient to avoid sitting for the five to ten minutes preceding the X-rays examination. Otherwise, in some cases of hypermobility or luxation, there is not time enough for the coccyx to come back into the neutral position. 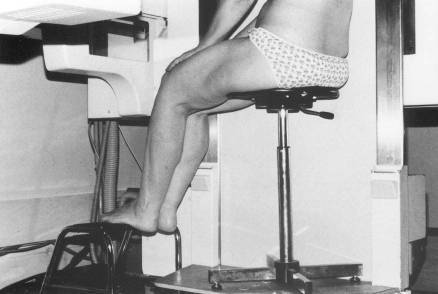 The second (dynamic) film is taken laterally while asking the patient to sit on a hard stool with the back slightly extended from a sitting position, in a posture in which the pain is most pronounced (figure 1). It is mandatory to wait a few minutes for the pain to occur. If the pain is not present, no sound conclusion should be drawn. Figure 1. The correct position to X-ray the coccyx in a sitting posture. Note the foot rest. Both films are superimposed on a bright light in order to compare and measure movement of the coccyx. The shapes of the two sacrum should correspond exactly, in order to evidence the coccygeal mobility. Only its mobile portion is considered, the saccrococcygeal disc being sometimes ossified or not mobile. 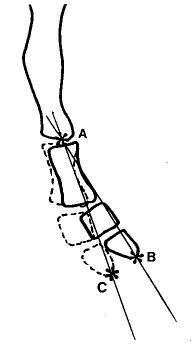 This movement is measured in degrees of flexion or extension (figure 2). Figure 2. Range of motion of the coccyx is measured in degrees (angle ABC). Bold line: standard film. Dotted line : coccyx in the sitting position. A: apex of the angle located at the caudal part of the sacrum (or of the first coccygeal vertebra if the sacro-coccygeal disc is ossified). The subject is facing to the right, the opposite of figure 1. In a first study (Maigne et al 1994), the films of 51 patients and controls were compared and read by two independent observers at two different time intervals, the second reading performed one month later. The final value used was the average of the four separate readings. Inter- and intraobserver variations of the angle measurement were 12.5% and 15.3% respectively, and the accuracy of the measurement technique was +/- 2.6 degrees. This is therefore a reliable technique, in particular in view of the definition of hypermobility (see below). In a control group consisting of 47 pain free volunteers with no history of local trauma and no more than two pregnancies (Maigne et al 1994), the mean mobility (flexion or extension) was 9.3+/-5.7 degrees (range from 0 to 22 degrees). Thirteen coccyges (27.6%) had an extension between 5 and 15 degrees and eight (17%) a flexion between 5 and 22 degrees. Twenty-four (51%) others had a very limited mobility between 0 and 5 degrees. In two cases, there was a slight (asymptomatic) backward slipping of less than 20% (one fifth of the AP diameter of the vertebra). Allowing for a certain degree of non pathologic variation, we therefore consider that flexion larger than 25-30 degrees represents hypermobility and slipping larger than 25% represents luxation. Extension larger than 15-20 degrees is also pathologic, but it is a very rare situation. Whether coccyges flex or extend in the sitting position (in controls and in patients) is based upon their position related to the horizontal plane of the seat at the very moment when the pelvis reaches the seat. If the coccyx is near a vertical position (related to the seat), the increase of the pelvic pressure will push it backward (extension). However, if the coccyx is near the horizontal position (i.e. parallel to the seat), the pelvic pressure will have no effect on it. It is the direct pressure exerted by the seat which pushes it forward (into flexion). The angle between the mobile coccyx and the horizontal is the coccygeal incidence. An approximate value of this angle can be calculated on the dynamic film (figure 3). If this angle is larger than 35 degrees, the coccyx is likely to extend when sitting. Under 12 degrees, it will flex. Between 12 and 35 degrees, 61% of the coccyges had flexion, and 39% extension in our study (Maigne et al, 1996). Figure 3. Measure of the coccygeal incidence. A: standing film. 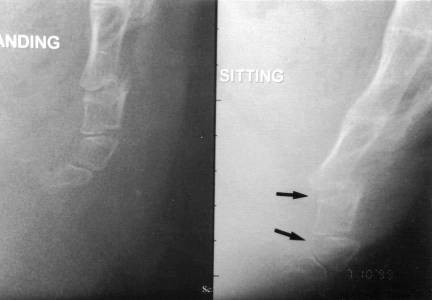 B : sitting film, showing a normal flexion. C: measure of the angle (i); this angle reflects the theoretical position that the mobile part of the coccyx would take if the subject was "sitting without the seat", that is without any force acting on it. M = coccygeal mobility, the angle by which the coccyx has rotated relative to the sacrum. SPR = saggital pelvic rotation, the angle by which the pelvis has rotated in going from standing to sitting. Standard and lateral sitting radiographs of more than 700 patients suffering from common coccygodynia for at least 2 months duration have been made since 1992. Four series of different patients have been currently published, allowing some firm conclusions on the pathology of the coccyx. Posterior luxation and subluxation: Sagittal luxation of all or part of the mobile portion of the coccyx while in the sitting position is the most striking abnormality observed (figure 4). It is noticed in 20 to 25% of the cases. The sacrococcygeal disc and the first intercoccygeal disc are equally affected. This luxation is spontaneously reduced in the standing position. In some very rare cases, it is permanent. Figure 4. Luxation of the first mobile vertebra in the sitting position (right). Standard film on the left. The subject is facing to the left, as in figure 1. Such a lesion is never observed in pain free controls and there is no doubt about its role in coccydynia. Patients with luxation have certain characteristics, which set them apart from those with normal dynamic films. Their Body Mass Index is statistically higher. A history of direct and violent traumatism on the coccyx prior to the pain is more often found. An acute pain while passing from the sitting to the standing position, more intense than the usual pain felt in the sitting position, is also frequently found. Hypermobility in flexion: Hypermobility is defined by flexion of the coccyx of more than 25-30 degrees in the sitting position (figure 5). It is found in 20 to 25% of the cases. The extreme and mean values in this subgroup is 25-70 and 35 degrees respectively. Hypermobility always occurs in flexion, and almost never in extension. Figure 5. Hypermobility. On the left, standard film. On the right, film in the sitting position, with the last joint of the coccyx lying horizontal. Subject is facing to the right. Mild hypermobility (25-35 degrees) can also be found in patients with hyperlaxity joint syndrome. It is not always a painful abnormality. Luxation and hypermobility can be interpreted as coccygeal instability similar to lumbar instability. It is of interest that contrary to the degenerative lumbar disc, the coccygeal disc does not sustain any compressive load which would lead to osteophytes formation, considered to act as restabilizing processes. Coccygeal spicule: We have described an abnormality in the form of a small bony excrescence on the dorsal aspect of the tip of the coccyx, involved in 15% of the cases of coccydynia. We termed it a 'spicule'. When it is present, it can always be readily palpated, jutting out under the skin; it would cause irritation on sitting. Interestingly, in 70% of the cases, there is a pit of greater or lesser depth in the skin overlying the spicule. This pit is usually fairly discreet, but in some cases, it is a frank retrococcygeal pilonidal sinus (without any discharge or abscess). We consider the pit to be evidence of the embryonic origin of the malformation (figure 6). These spicules are most commonly seen in non mobile coccyges, in which the pressure from the spicule is made worse by the inability of the coccyx to take evasive action. 4. pain relief following local anaesthesia. Coccyges without radiologic abnormality: In 40% of the cases, the dynamic exploration fails to demonstrate a lesion. 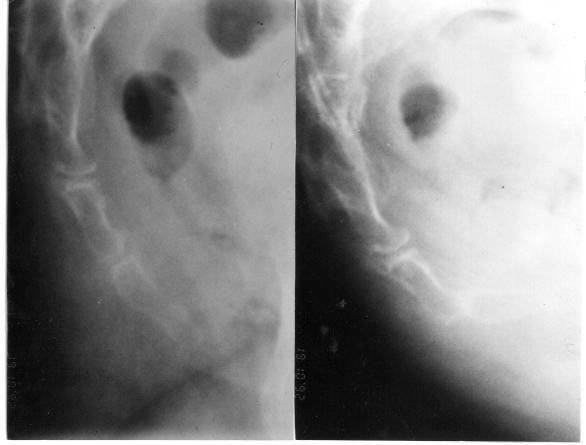 These cases with normal dynamic films represent the actual "idiopathic" coccydynia. The pain may be related to different problems. · Intradiscal inflammation. Some of these patients respond well to an intradiscal (coccygeal) injection, making likely a diagnosis of chronic joint inflammation. · Chronic bursitis. In case of a rigid coccyx, with pain located at the tip, even without spicule, a bursitis is possible. Injection of the subcutaneous tissues with anaesthetic may suppress symptoms, thus confirming the diagnosis. · In some cases, the pain is located at the sacral insertion of the sacrotuberous ligament. This could be compared to a local sprain, and treated with steroid injections. · Psychogenic pain ('hysteria', neurotic pain or depression) was formerly considered as a common aetiology. In our different series, we have considered this diagnosis in only a very few cases. The main feature is a permanent pain, not enhanced by sitting, which is fairly abnormal in coccydynia. · Pain referred from other structures is another possibility. The sacroiliac joint or the lumbosacral area are sometimes advocated as a possible origin of coccydynia. These diagnosis should be evoked only if the coccyx appears normal after the dynamic exploration. Whatever the lesion observed on the dynamic films, palpation over the coccygeal area should demonstrate tenderness corresponding precisely to the 'pathologic' level (i.e. coccygeal disc). The other level should not be tender. When there is no obvious lesion on the films, careful palpation is the only way to determine the tender level, deemed to be the responsible level. This is specially important if a treatment by intradiscal injection is considered. Three methods can be used: manipulation, injection or surgery (coccygectomy). Manual treatments: Manual treatments consist in either manipulations of the coccyx or massages of the pelvic muscles (levator ani or piriformis). This is a very classic treatment of coccygeal disorders. In an open study by Wray et al, adding manipulation to injection treatment produced a 25% increase in the rate of satisfactory results. Massages of the pelvic floor were described by Thiele (1937). Manipulations consist in mobilisations of the coccyx in joint mobilisation and stretching of the coccyx (and of the attached muscles) with the rectal finger. This latter manoeuvre was described by R Maigne (1961). We have designed a personal technique, consisting in a mild levator and external sphincter stretch without moving the coccyx (Maigne et al, 2001). These three techniques have been compared in a prospective pilot study (Maigne et al, 2001). Patients were randomized into three groups, each of which received three to four sessions of one of these three different treatments (levator ani massage, joint mobilization, mild levator stretch). Assessment with a visual analog scale was performed by an independent observer, at seven days, 30 days, six months, and two years. Results of the manual treatments were satisfactory in 25.7% of cases at six months, and in 24.3% at two years. Results varied with the cause of the coccydynia. Patients with a rigid coccyx did least well; we assume that the reason is that the cause for pain is inflammatory in nature (spicule or bursitis). Those with a normally mobile coccyx did best. This could be because one reason for the pain could be a spasm (or at least a painful tension) of the levator ani. Patients with luxation or hypermobility had in-between results (more important was the pain intensity, poorer were the results). Levator ani massage and stretch were more effective than joint mobilization, which worked only in patients with a normally mobile coccyx. Pain when standing up from sitting, and excessive levator tone, were associated with a good outcome. However, none of the results was significant, because of the low success rate of manual treatment. There is a need for a placebo-controlled study, to establish conclusively whether manual treatments are effective. This study is current in our department. To date (2001-12-01), 80 patients have been enrolled. Injections: The technique of coccygeal discography is simple. It is conducted under fluoroscopic guidance. The patient is asked to lie on his/her left side with the hips flexed. The skin is carefully disinfected. 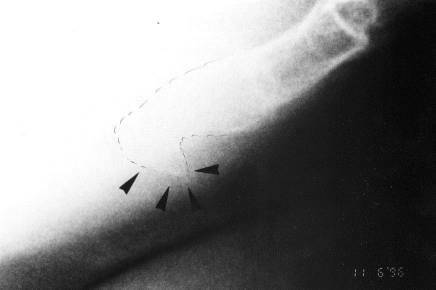 The responsible disc (to be injected) is selected under the following criteria: radiologic abnormality (luxation or hypermobility) and/or tenderness at this level. When a spicule is responsible, there is no need to inject a disc, but the spicule itself. Each disc or synovial joint is entered with a 25g, 25mm needle under aseptic conditions, using a posterior approach through the midline, to avoid small blood vessels. We inject a very small amount of dye to control the position of the needle and a steroid (figure 7). The injection is generally effective within one week. In case of partial relief, another injection can be done one month later. The abnormal mobility, if present, remains, but ceases to be painful. Figure 7. Coccygeal discography. The figure shows a synovial joint. In our 1996 study (Maigne et al, 1996), we have established that patients with luxation or hypermobility were better responders to a local intradiscal corticosteroid injection than patients with normal coccyges. About two months after the injection, 50% of the patients with luxation or hypermobility were improved or healed, whereas only 27% of the patients with normal coccyges improved. The difference is significant (Chi square = 4.53, p = 0.033). In case of relapse, a second injection may be performed. If the result is better after this second injection (a longer relief), the prognosis is good. If the relief is shorter, injections do not appear to be the right treatment. Usually, spicule do very well after one or two injections. Another treatment for unstable coccyges could be prolotherapy. Although I have no experience in this method, the rationale for its use is interesting (Dorman, personal communication, 1995). Surgical coccygectomy: Coccygectomy is a controversial subject. Some authors have reported good results; however, selection criteria are ill-defined. Others advise against this procedure. Pyper stated that 'there is no constant factor in the history, no reliable physical sign, and no specific radiographic change that can be regarded as a definite pointer in advising operation' (Pyper, 1957). We have published a study to validate an objective criterion for patient selection: radiological instability of the coccyx (intermittent luxation, or hypermobility of the coccyx). We have enrolled prospectively 37 patients with chronic coccygodynia due to coccygeal instability (intermittent luxation, or hypermobility) unrelieved by conservative treatment, and not involved in litigation. The operation was performed by the same surgeon (L Doursounian). Patients were followed up for a minimum of two years after coccygectomy, with independent assessment at two years. There were 23 excellent and eleven good (91%), and three poor results. This appear to be one of the best results of the literature. The average time to definitive improvement was 4 to 8 months, which is fairly long, but in line with other authors' reports. Such a long interval of time could be explained by a 'phantom limb syndrome', coccygectomy being an amputation. When improvement is slow to appear, we prescribe amitriptyline, which seems to help. Thus, coccygectomy gives good results in a subset of patients with instability of the coccyx. This objective criterion (instability of the coccyx) should replace a subjective psychological assessment. Common coccydynia is related to coccygeal instability in almost half of the cases. The diagnosis should be documented with dynamic X-ray films to evidence luxations and hypermobility, wich may need specific treatments. Spicules, which account for 15% of the cases are also easy to diagnose. Treatment of common coccydynia should be considered according to this diagnosis.